Do you want to grow and eat real nutritious food for you & Your children? The 6-Week Grow Your Own Nutrition practical online series is designed to give you the guidance you need to create your very own fresh and functional food garden that is aligned with nature. Whether you are curious, a beginner or have some experience growing food, this course will provide you the permaculture principles, techniques, and ideas for growing food in a regenerative way. 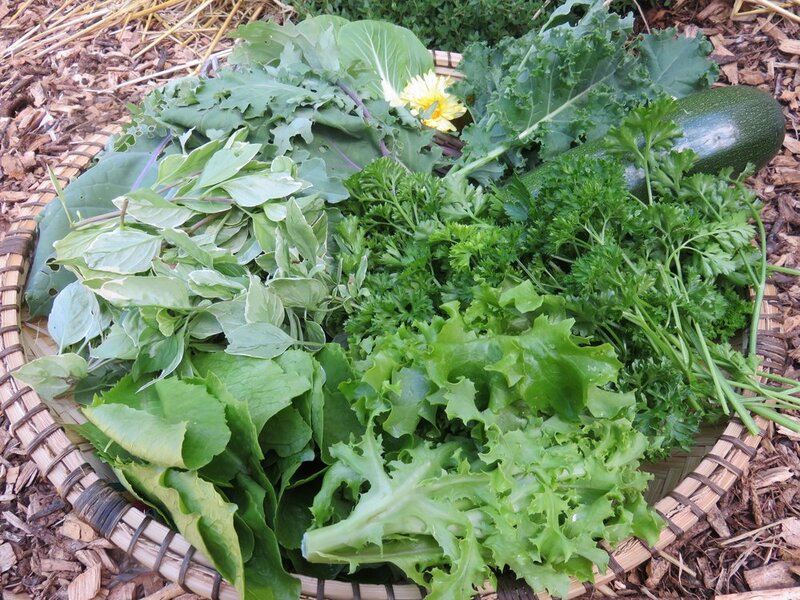 Now is the time to start growing some of your own nutrient-dense food in your own permaculture garden! Are you looking to learn more about how to regenerate soil, compost and grow nutrient-dense food? Not sure where to start when it comes to designing your front or backyard functional food garden? Are you looking to learn more about permaculture principles and how to apply them for resiliency in your garden? Despite having grown some food before, are feeling like you could benefit from guidance on how to work with, not against nature, when growing your food? If you said yes to the above, I would like to invite you to join my program: Grow Your Own Nutrition. Growing fresh and functional food aligned with nature is one of the most powerful ways you can help increase the nutrition and health of your child and of the planet. This 6-week live series will give you a kick start for how to grow and eat regenerative food. A discussion area to directly ask your questions throughout the course. You will be invited to join a private Facebook Group to connect with current and past students, share photos, experiences and happenings in your garden. + What kind of program is this? We want to design food systems that mimic nature to optimize the health of soil to enhance the nutrition, health and resiliency of our children, each other and the planet. + Will I have access to the sessions to watch on my own time? Yes. All sessions are uploaded to a private student site to watch at your leisure, as many times as you'd like. + Will I be able to ask questions? Definitely! Our discussion area on the private site is a great place. Also you are invited to connect on the private facebook where you will be able to connect with current and past students for support even after the course. In the most simpliest definition, permaculture is a whole systems design approach for creating regenerative human habitats in harmony with nature. Permaculture has a set of ethics and design principles, which can be applied to all areas of our lives, including gardens and food forests, energy systems, business, economy and social structures. + What is a permaculture garden? A permaculture garden is both an art and an science of growing plants in patterns that supports the mutually beneficial relationships the way nature does. By doing so we can create largely self-maintaining healthy, beautiful, high-yield, and biodiverse gardens that grow fruits, vegetables, herbs, medicinal plants and other useful plants. Permaculture gardens offer design systems that can support both urban and rural landscapes. Awesome! Get your questions answered by emailing me directly. I'm a regenerative strategist, permaculture practitioner, and holistic nutritionist. I'm the founder of Circular Nutrition, an education and regenerative lifestyle business. After having explored multiple permaculture farms and regenerative communities worldwide over four years and studying permaculture design and soil regeneration with world-renowned teachers, I became very passionate about sharing and educating about how to grow real and regenerative food to optimize nutritional health of the soil, plants, bodies and earth. I created this online series to teach you how to grow and eat real food and take charge of yours and your family’s health. Soil is our nutritional bank account for our existence. Healthy, living soil not only grows incredibly nutrient-dense food, but also sequesters carbon from the atmosphere being a climate change solution. Starting to grow some of your own food in a regenerative way or supporting farmers, brands and companies that do, you are playing a powerful role in crafting a healthier future for your children and planet. I want you and your children to be eating real and nutrient-dense food. I want food to be grown in a way that is regenerating soil and building a healthy relationship with nature. I want our food system to be comprised of food void of any chemicals and genetic engineering. I want to create a healthier, regenerative planet for now and in the future. Click on the link below and join Grow Your Own Nutrition Online Series Today! Together we can grow nutritious food regeneratively and help restore the health of our children and planet while doing so. If you are seeking permaculture design consulting for your edible garden or landscape, click here.